When it comes to shoes, women are always in the spotlight. Men, on the other hand, are simple, all the way from their tops down to the tip of their shoes. It’s enough if it covers their feet, as long as it’s necessary and, at most, shines on special occasions. But was it always this way? What do our ancestors have to say about it? Opanci are a type of leather footwear. Sounds good, but they were not designed by Gucci or Timberland. The peasant himself made them as well as he knew how to or, at most, he bartered with the local craftsmen for the shoes. Women also wore opanci, but they’re associated more with men, because they were more visible on them. During their glory, opanci were worn throughout the Balkan region. But 50 years ago, the world had enough of them and stopped wearing them. This was most likely because the industrial revolution managed to reach the Balkans and invaded footwear production. 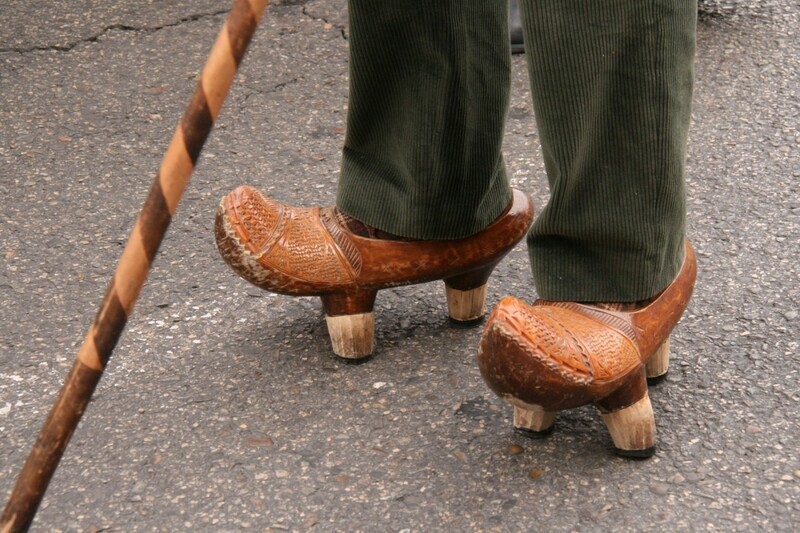 Currently, opanci are worn only in folklore events. Interestingly, although they were worn in different areas, the etymological meaning is “climbing shoes” 1)”Opanak” in Wikipedia. Do you feel like climbing? The demolition of opanci does not mean they cannot compete for a world record. 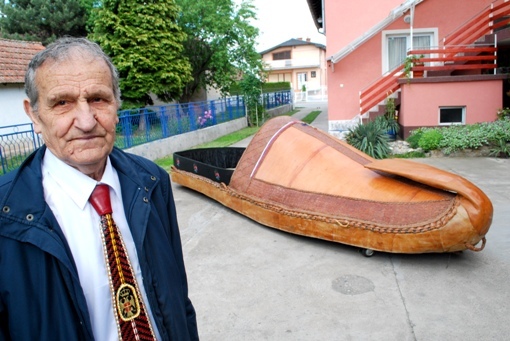 Drakče Jevtic, a Serbian from Svilajnac and opanci creator, made the largest pair ever in history. The huge shoes are 6 meters long and would be good only for a giant about 40 meters tall. So if you can’t ever find shoes big enough, just run down to the Serbian master – he will surely hook you up. Perhaps the name does not ring a bell, and you might even think that it’s some sort of curse word. But you have previously seen the shoes in question without even knowing it. Have you ever heard that in Athens, at certain hours, the guards in front of the Presidency and the Unknown Soldier Monument change? 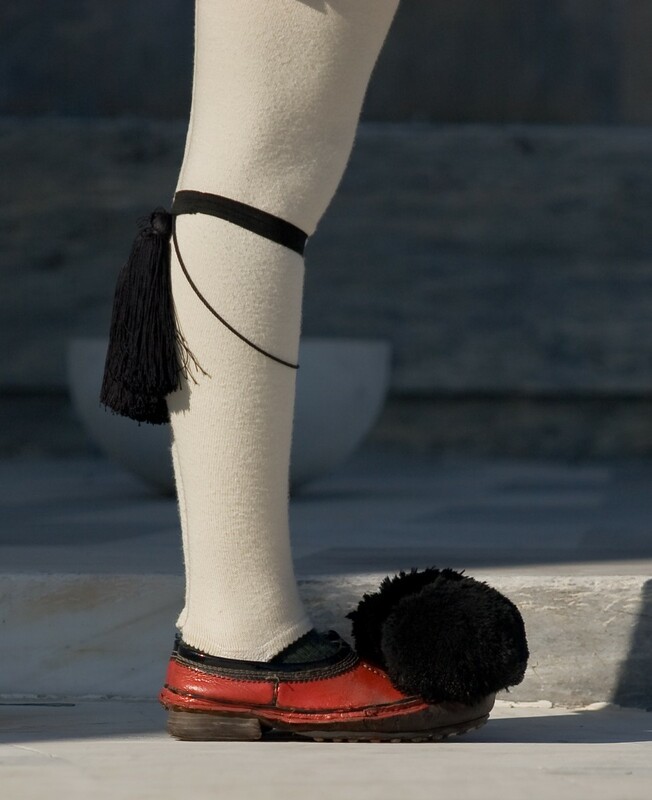 You may have noticed that those soldiers wear some sort of leather attached to their feet, which has a pompom on top. Well, these are the tsarouhi. They seem pretty old. When were they ever fashionable? Their first appearance occurred during the Byzantine period and has evolved according to the tastes of neighboring tribes. They even have Turkish influences. After all, fashion unites souls and melts enmities, right? As with any other object in vogue, for a while tsarouhis were worn by all Greek citizens, whether urban or rural. It represents an evolution from sandals, because many pieces are made of leather, stitched together in a form that better protects the foot. Initially, the pompom on the top was small and had practical purpose: to cover the hole that formed on the top. But you know that pride runs through the veins of Greeks and they wouldn’t lose the opportunity to show off. So the pompoms were “inflated”. As Greece won its independence in the early nineteenth century, this footwear was only worn in the outskirts or in remote areas. Are the Turkish influences in the design of the tsarouhis to be blamed? A century later, someone thought it was necessary to strengthen the soles of tsarouhis and give them to the Evzon military units to wear. After WWI, traditional footwear was replaced by another, more practical for active soldiers. 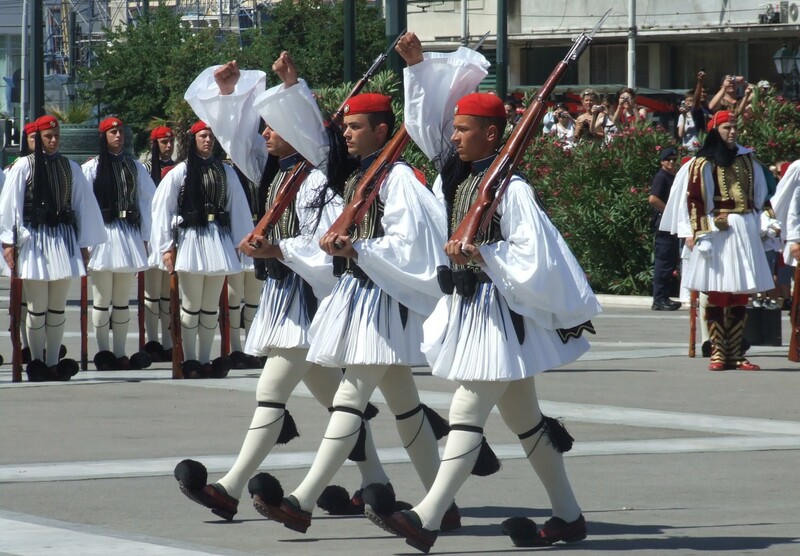 Currently, tsarouhis remain a symbol of Greek soldiers in the highlands (Evzoni) and are worn by presidential guards. Did the pointy boots, in vogue some time ago, seem exaggerated to you? In this case, what do you think about crakow, shoes with extremely elongated pointy fronts?! They appeared in the second half of the fourteenth century. The name comes from their home, the Polish city, Krakow 2)”Crakow” in Encyclopædia Britannica. No one knows who invented them, but indeed this man was a trend-setter who would have given all of today’s stars a taste of what class really is. They were in great fashion throughout the fifteenth century. The population has become so obsessed with them that the Pope and the King of Great Britain, Henry IV, barely managed to stop the phenomenon. But “the devil” was not beaten. “He” still lifts up his head from time to time. For example, in Mexico. Nowadays, high heels are a symbol of femininity. And not by accident. There are many studies that show high heels offer a woman a position which awakens the subconscious of a man. Thus telling the man that she is ready for mating, similar to those observed in other mammal mating rituals. Then why is it that high heels were first worn by men?! Yes, it is true, but do not think dirty thoughts! The heels were invented by the Persians for a very practical, but unexpected reason: this was so the horseback rider’s leg could better stabilize when getting up on the saddle. Especially in combat, when he was shooting his arrows 3)”Why did men stop wearing high heels?” by William Kremer, article published by BBC World Service on January 23, 2013. After the invention had proved its utility, you realize that no one spends time changing their shoes every time they climb on or get down from the horse. So they came into common use. Well, not for everyone. A few centuries ago, they didn’t have the current means and materials. Making shoes was a great trade. And the price was the same. So there were some élite troops walking around in high heels all day. This made the nobles, whom the soldiers worked for, seem shorter. 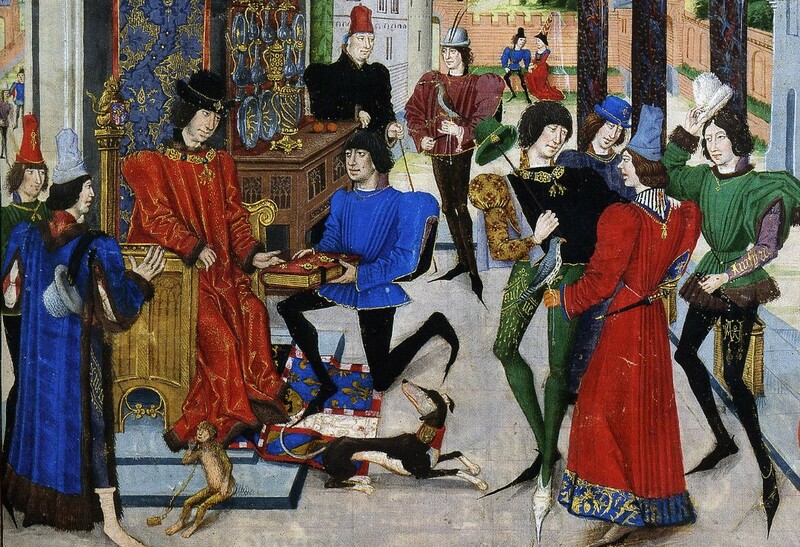 How long do you think it took before the nobles also wanted high heels on the soles of their shoes?! This trend caught on in Europe around 1599, after a Persian diplomatic mission 4)”Why did men stop wearing high heels?” by William Kremer, article published by BBC World Service on January 23, 2013. Nobility liked these shoes that highlighted their thighs, which, at that time, high society men were not hiding in their pants. But fashion also spread in aristocracy. Men in heels were “macho”. Madness started at that point: who stood taller in front of the others! 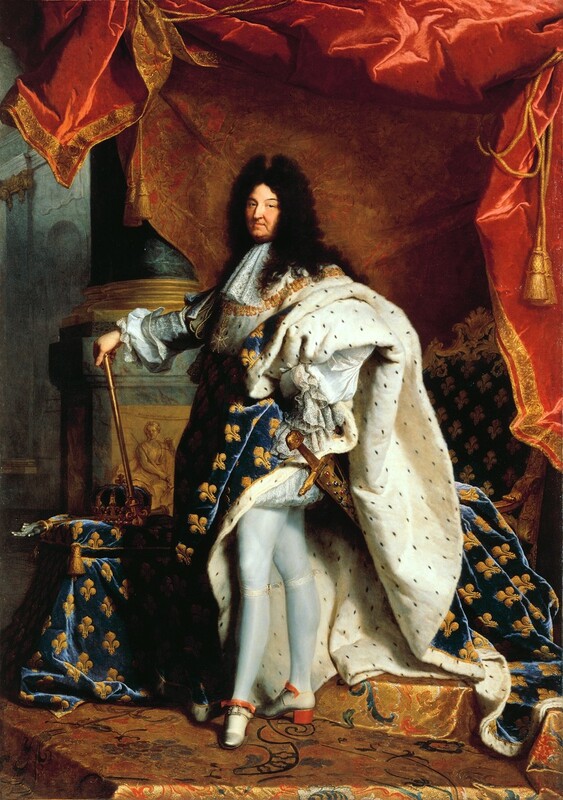 If you had the misfortune to be short and, like Louis XIV of France, having only been 1.63 meters in height, it was a must to wear 10cm heels 5)”Why did men stop wearing high heels?” by William Kremer, article published by BBC World Service on January 23, 2013. However, as they could not make heels as high as they wished, and chopines had became the laughing-stock, the king in question thought of something else to look smarter. 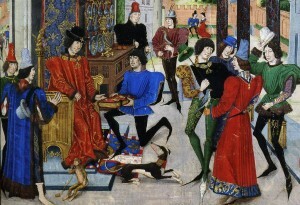 He decreed that only he and members of the Court were allowed to wear red heels. When wanting to know if you were dealing with a hotshot, the only important thing to look at were the heels. And if wanting to fool someone that you were the sizable one, you only had to dye your heels red 6)”Why did men stop wearing high heels?” by William Kremer, article published by BBC World Service on January 23, 2013. France gave even since then, setting trends in fashion. So other Courts followed their lead. 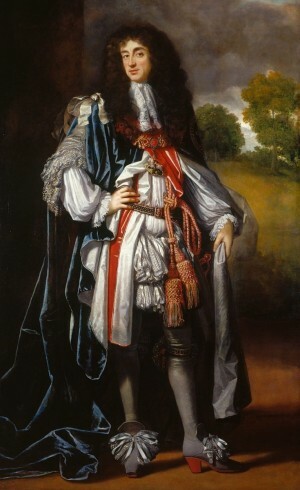 Charles II of England was walking in high heels, even though he was 1.85 meters in height. I wonder, when someone was addressed as “Your Highness”, did that included the shoes? Just when men were showing off in the mid-seventeenth century, an event with unexpected consequences took place: women’s fashion began to draw inspiration from masculine fashion (and held on to it until this day!). Heels were among the first target. 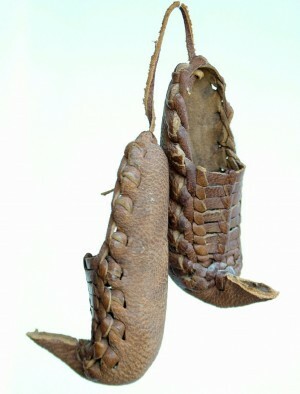 But these were so successful when worn by women that in less than a century no man wanted to wear them anymore. The symbol of masculinity become a symbol of femininity. Say you saw some heels worn by someone from the high society and you wanted a pair. But unfortunately, you live in an area with mountains and hills. Have you ever walked downhill in heels? But when the people from Cantabria want to get things done, they don’t drop out for fear of such a trifle. That is why they invented a new type of footwear: albarca. 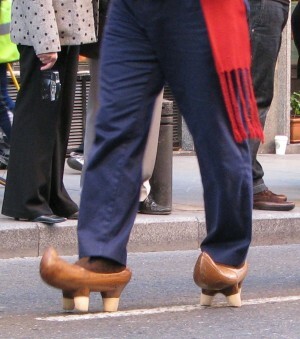 A type of carved wooden clogs. To solve the problem of balance, in addition to the rear heel, they added two extra heels in front 7)”Strange Wooden Shoes” by Charles S. Gil, article published in Northern Exposure Spain on January 29, 2012. 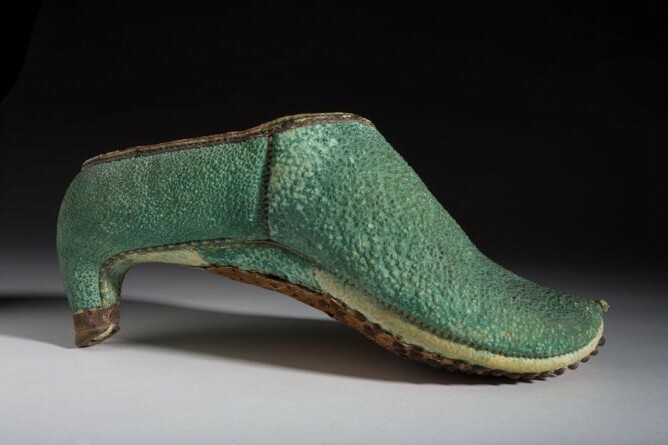 No one knows when these bizarre shoes appeared, but they were certified since 1657. And are still worn, even if not often. Bet they are really proud of them. Men were working on them when they weren’t working on anything else. For them, it was practical footwear – for the 3 heels were actually spikes for improving grip. There are also models for women, but for the sake of perpetuating the species, let’s hope they don’t come back in fashion. The Japanese have many specific kinds of shoes, origins of which are lost in time. These include geta – worn especially by beautiful Japanese women. But geta are not just for women. They were worn by everyone. And until you’ve seen a man in a pair of geta, you’ve seen nothing. As you can see, men hardly have a type of footwear only for themselves. Each time they find something new to wear, women want it. But the reverse is not valid. Or are times changing? !